Pebble floors are soft on the feet and complement a large variety of bathroom tile. If you are considering a pebble floor project, go the adventurous route by searching for vividly colored, multi-shaped pebbles lining the seashore or dry river bottoms near you. On the other hand, a thrifty do-it-yourselfer looking to save the hassle and effort of hunting down pieces can use mesh-backed 12-inch pebble floor sheets. 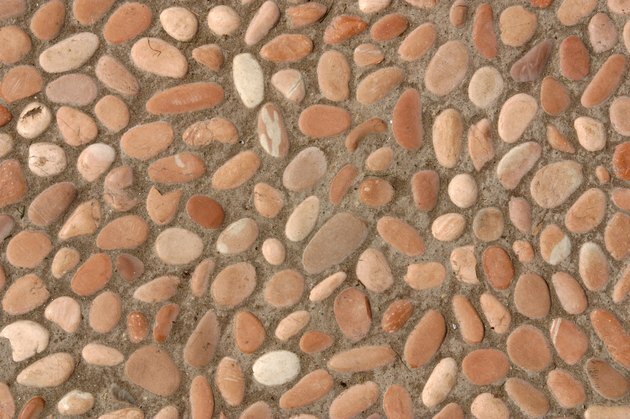 Salmon-colored pebble is one of many choices for the floor. Purchase and install mesh-backed pebble sheets. Tile and stone producers sell multiple lines of pebble stone flooring. Pebble stone flooring comes on an easily installed tile-like mesh sheet. Shop prices around at different tile suppliers both in your city and the Internet for a good deal: Sheet-mounted pebble stone may save you both time and money. Search for pebbles in dry river beds and the ocean. Check local regulations to verify that it is legal to remove pebble rocks from the area you are considering. Use a pick, shovel or spade to unearth the pebbles. Use a 5-gallon bucket to transport the pebbles in your vehicles. If this approach is not an option, visit the building product or garden section of your local home improvement retailer and locate pebbles to purchase. Wash each individual pebble. Use a mild detergent or soap to scrub away any salts (especially if the pebbles are from the ocean), oils, dirt and grime. Failing to clean the pebbles will result in an inadequate bond after you install them on the floor. Allow time for the pebbles to dry before proceeding. Select the proper adhesive. The correct adhesive choice will make the difference between a job that lasts over time and one that does not. Polymer-modified thinset mortars bond well to pebbles. Ensure a good bond to the installation (or "substrate"). Use a diamond-wheel grinder to "score" or scuff the surface to provide a bond to the pebble tiles. Mix thinset in a bucket. Use a notched-trowel to apply polymer-modified thinset to the substrate. Use a mason's trowel to apply the thinset to each individual pebble (if installing piece by piece). Grout the pebble pieces. 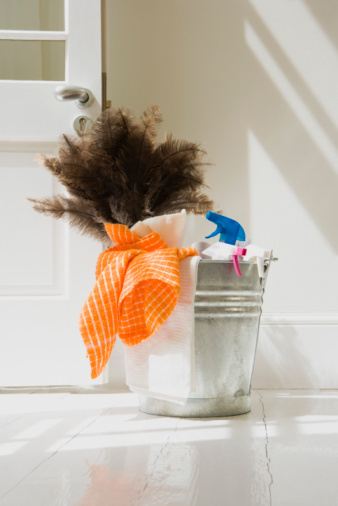 Use a rubber grout float to squeeze the grout into every nook and cranny. Allow an hour for the grout to stiffen, and then wash it off the pebble's surface with a sponge. Wait another hour to pass before providing a clean wash. Wait 24 hours for the grout and thinset to dry. Purchase a sealer made for tile and stone called "penetrating sealer." Seal the pebbles -- and especially the grout -- with the penetrating sealer. Follow the manufacturer's directions, and do not walk on the pebble floor before the sealer has dried.